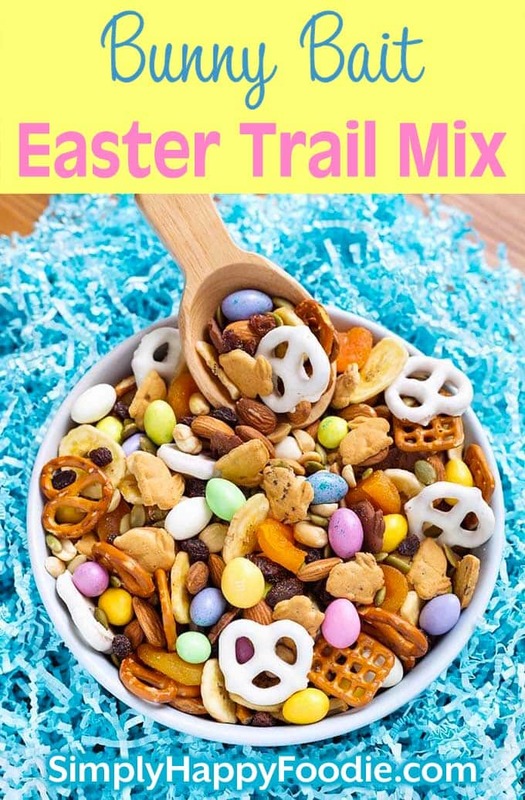 Bunny Bait Easter Trail Mix is fun snack food for kids and adults! 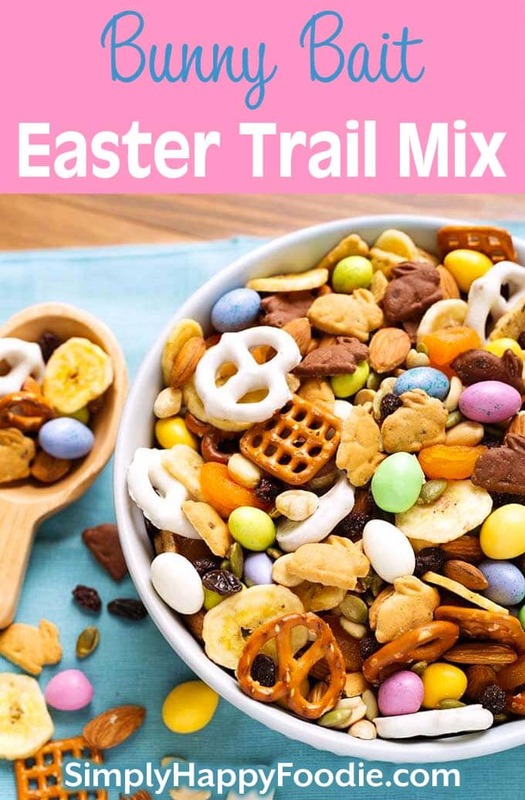 There is a lot of good stuff in this easy trail mix, with a salty and sweet mixture of Easter candy, nuts, pretzels, and more! Trail mix is one of those snacks that I could mindlessly eat all day long! Kind of like popcorn, only there is a sweet bite here and there, as well as lots of different textures. That makes it so good! 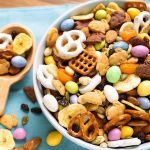 The idea for different Holiday trail mixes is fun! I will have one coming out for Christmas, and one for Halloween, as well. I love that the combinations of goodies can so easily be switched to reflect the season. 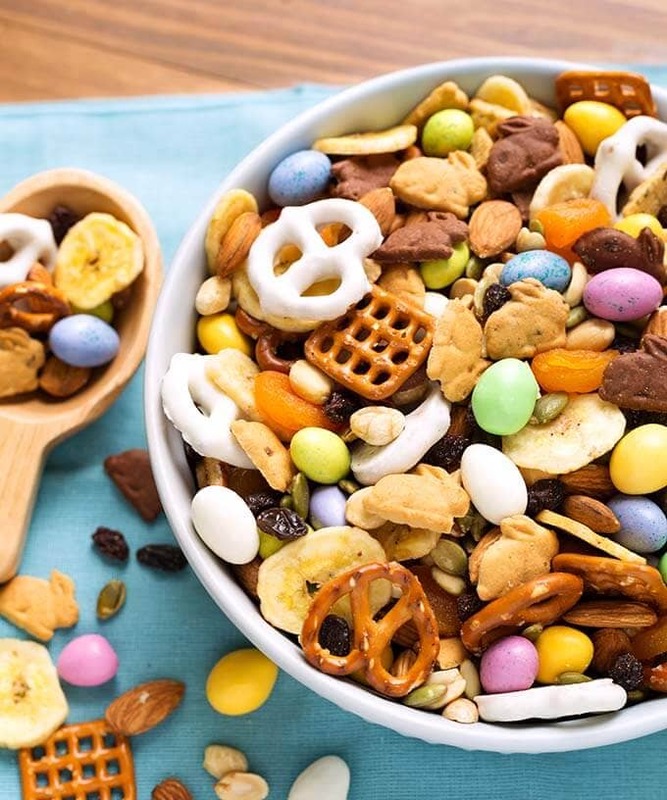 This trail mix recipe is whatever you want to make it. Swap out the ingredients that you don’t want, or to accommodate allergies, diet, etc. There is no right or wrong way! 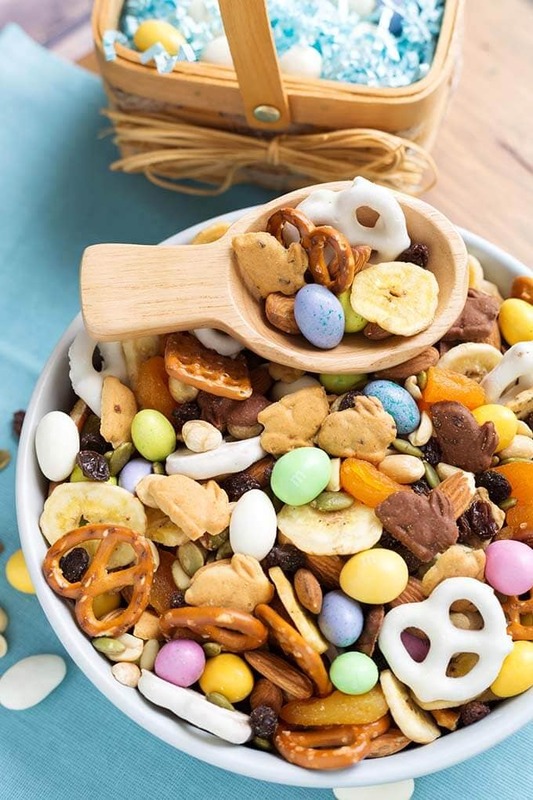 This Bunny Bait Easter Trail Mix is about half healthy ingredients like pumpkin seeds, raisins, dried apricots, and raw almonds. That makes it all the more fun to have the sweet, not as healthy candy in there. It’s not bad though, as the only candy in this trail mix is the mini candy coated chocolate Easter eggs. The bunny graham crackers are organic, from Annie’s®, and the yogurt covered pretzels are just a little naughty. But they taste so good! A fun idea is to let the kids help you shop for the ingredients. Maybe let each child choose an ingredient (parent approved, of course!). They will have fun helping to measure and mix the ingredients together. I keep my Bunny Bail Easter Trail Mix stored in a big glass jar with a lid. If I send some with the hubby to work, I just scoop some out and into a resealable baggie. When our grandkids want some, I fill a small dish that they can eat as they do crafts or watch TV. They have no clue that there is a lot of healthy stuff in there! As long as there is some candy! Keep in glass jars with the lids on. Serve in baggies of individual servings to take to school, work, or on road trips. This Bunny Bait Trail Mix makes a nice Teacher's gift. Adjust the amounts to suit your taste. Swap out any ingredient that you don't want. My rating is for your idea (and I do love all the ingredients). I have 17 grandchildren. Some have food allergies and some are just picky eaters. 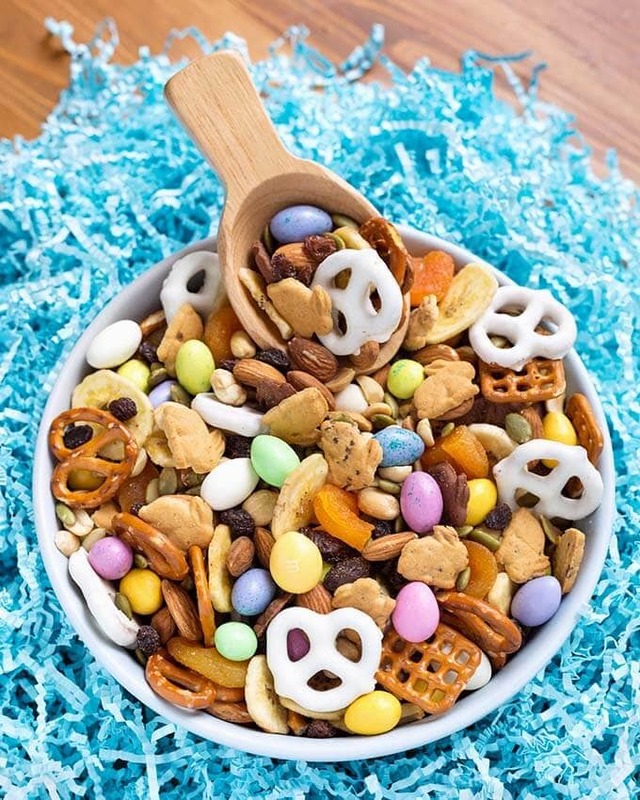 As an Easter gathering activity, I want to do a Make-You-Own trail mix station. This is awesome. For we non-creative folks (me! ), this is HUGE!!! PS: I’ve only recently discovered you website while gathering Instant Pot recipes, and I am really loving your site! Hi Patricia! Thank you for this comment and rating! I LOVE your idea of a make your own style station. So many great things you can have! One ingredient I wish I had mentioned is coconut (unsweetened) and some dried pineapple chunks. There are even dairy free chocolate chips! Have fun with the Grands!